This post continues my account of a two-day visit with Greig Fraser, ASC, ACS, on the set of Rogue One at Pinewood studios, and features part of my subsequent conversations with the cinematographer at Camerimage, and via Skype. If you haven’t already done so, you may want to start by reading my previous post about my first day on the set. Greig Fraser has kindly invited me to return for a set visit to Rogue for a second day. After once again navigating the security checkpoints, I arrive to see a 20 foot cube, whose pitch, yaw and roll are controlled by a giant gimbal mechanism. 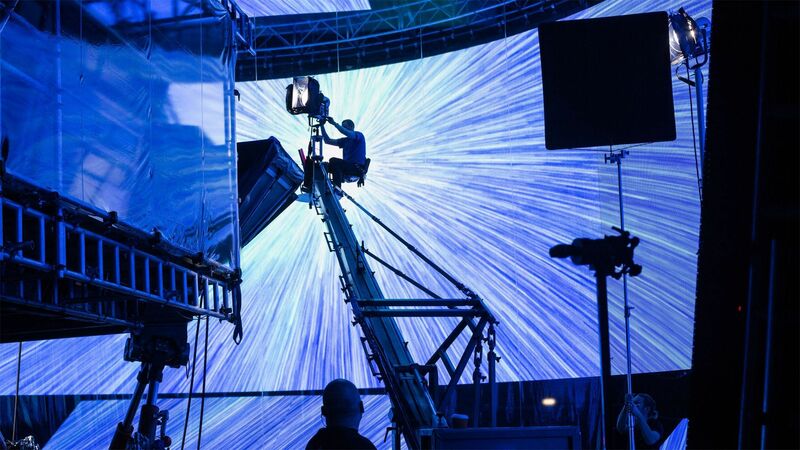 Inside the cube is the interior of the Rebels’ U-wing starfighter, where director Gareth Edwards is shooting the actors handheld with an Alexa 65. Greig stands some 30 feet away from the gimbal, looking at the video assist and overseeing the interactive lighting, which is provided by a gigantic LED screen surrounding the set in a U-shaped configuration. Supplied by VER, the screen measures approximately 160 feet long and 20 feet tall, and is made up of some 600 lightweight, high brightness WinVision Air 9mm LED panels. Additional panels above, below and in mobile configurations provide supplemental coverage for the set. The image on the LED panels is a virtual planet from space, and then a closer view of the planet’s landscape as the U-wing spaceship “flies” over it. What’s impressive about this set-up is that the inside of the space ship is being lit by the image of a virtual planet created by computer graphics. This is a lighting technique I first saw pioneered by Emmanuel Lubezki, ASC, AMC, on Gravity. 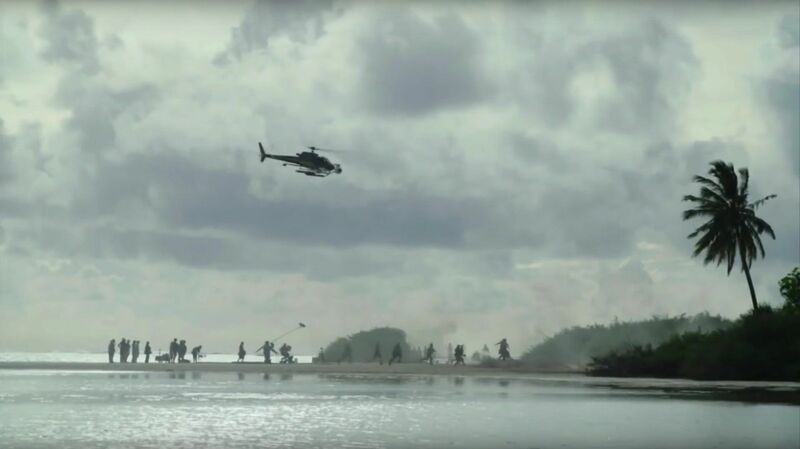 The Rogue One set takes this concept of lighting real actors with virtual landscapes to a larger scale. Months after my set visit, I speak to Greig about Rogue One when we meet at Camerimage. We continue our conversation via Skype in the weeks that follow. 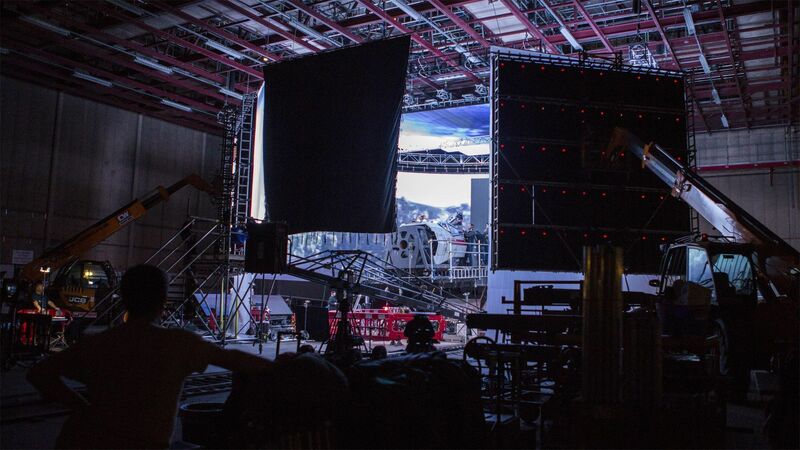 Benjamin B: Did you really manage to light Rogue One entirely with LEDs? Greig Fraser: We did have one set with HMIs on the Scarif control tower set, but effectively, yes. During prep I put the argument forward to production and to the rental company that, with these lights — the Digital Sputniks, the Creamsources , the Arri SkyPanels, the Litegear LiteRibbon — there were finally enough LED tools to do an entire movie with just LEDs and natural light. Everybody agreed. BB: Why choose LEDs ? They are more expensive than Tungsten and HMI technologies. Fraser: On this film, we had the resources to be able to afford them, and that cost was offset by big savings in energy, wiring and gels. We also used lights for effects. On the wet set you visited, we used 4-by-4 DS units to simulate the light from X-wings flying above and bombing the planet. 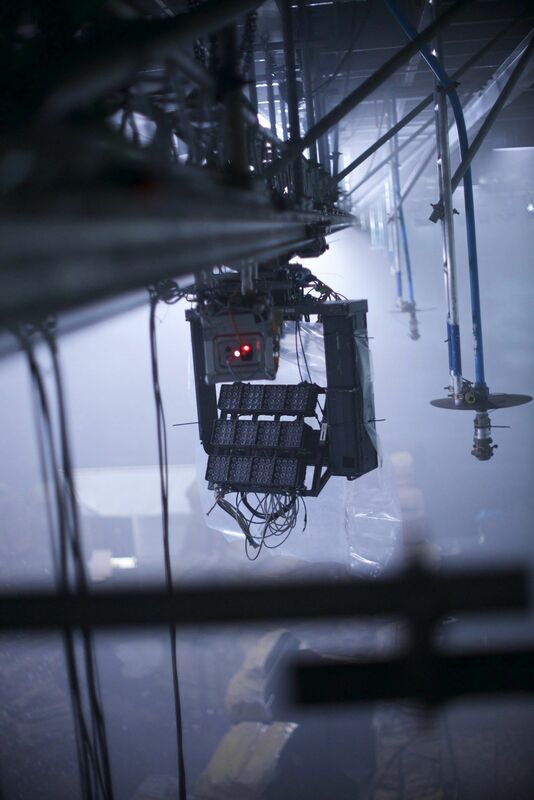 [Special-effects supervisor] Neil Corbould helped to build a trolly system on a steel girder to run DS lights from one end of the stage to another; we could fly over, but we couldn’t drop down. 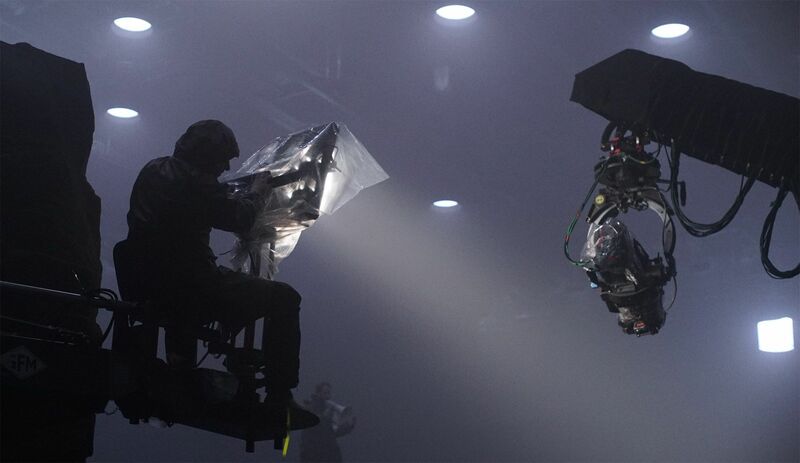 For a landing-light effect, we put nine Digital Sputniks on a crane with a remote head, and an electrician used the wheels to move the beam as it came down to the stage. BB: The wet set was very moody and dark. Fraser: The idea was a planet with an eternal dusk. So color was very important, and we hung 30 Creamsource Sky units above at 11000 degrees Kelvin. The mood was heightened by smoke and water vapor, and a painted backing, with Skypanels as cyc lights and more DS units to create colored laser effects. I kept the lights even lower to make the landing light stand out. Fraser: See the subtle mixture of daylight colors on my hand here? [Greig moves his hand near the window in the Camerimage café] It’s almost impossible to achieve that color with Tungsten, and even with HMIs. But with LEDs it can easily be achieved. BB: You feel you get more precise colors with LEDs, and perhaps four-color LEDs? BB: You mean like: ‘Give me a point of red’? There’s a massive color chasm that I wasn’t aware of before. I used to look at HMIs and say: ‘That’s a little green or magenta’. That now seems like 3-year old speak. The present LED technology goes so much farther. BB: But all these sources have to be controlled by DMX? Fraser: This is the next problem, which is that unfortunately, DMX is not good enough. DMX is built for the theater. You can add color, but not minute color. Especially when you’re talking about a camera like the Alexa 65 that sees Color so intimately. I would like to see a better interactive interface for color control of DMX: something like the DaVinci Resolve or Baselight. I would love to have that at my fingertips. BB: What was your overall lighting approach for Rogue One? Fraser: It’s the combination of soft lighting, soft lenses and a sharp format that gave us the right look and feel. We built lights into the props with Digital Sputnicks, the same lights we used as sky lights and wall lights. We also built LED LiteRibbons from LiteGear into the sets, they were RGB plus Amber or White, which meant we could have the same control and finesse that we had with the other LED units. Fraser: I think natural lighting is the most beautiful; if I could do everything with natural lighting, I would. But we have to light because we’re working on stages and we have to illuminate the actors and action — not to mention hyperspace! So you have to come up with ways of either controlling natural light or coming up with lighting that looks just as natural. 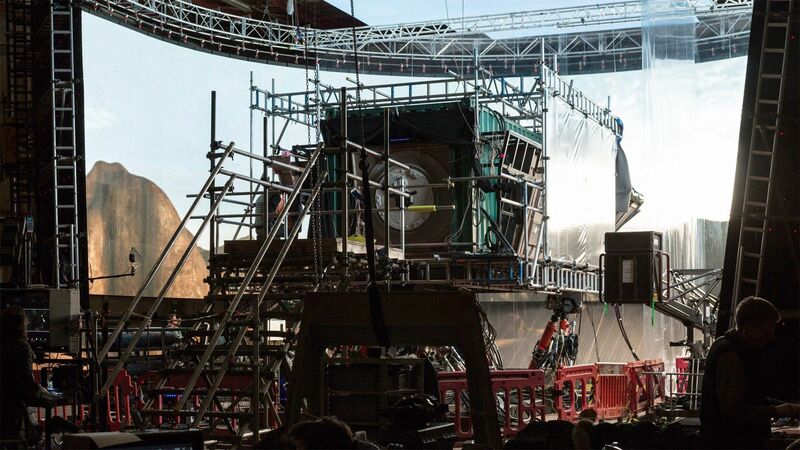 One example is our set on Cardington Studios. It’s a massive stage, which used to be a hangar for blimps; it’s also where George Lucas shot the first Star Wars in 1977. 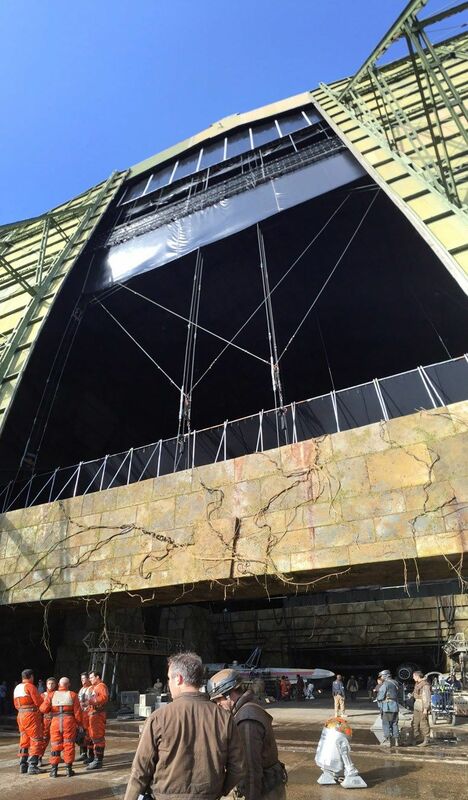 We used that stage for the [Rebel Alliance base in the] pyramids of Yavin IV. We opened the giant stage doors, but they let in too much light, so I had to control it. The riggers put together an amazing Roman blind system that I could pull up in stages. So we made a gap at the bottom of the door that you see in frame, and another gap at the very top, above the frame line to get light into the back section of the set. Another example of natural light was our location in Iceland. We shot in these stunning landscapes of black sand. The light was really lovely, flat and soft, and I simply supplemented it with a DS [Digital Sputnick] as an eyelight. BB: Did you shoot a lot of bluescreen? Fraser: Gareth has a background in visual effects, so he and John Knoll got along very well. And interestingly Gareth wanted to do as little process screens as possible, so we shot very little bluescreen, but we did do some black and white screens. 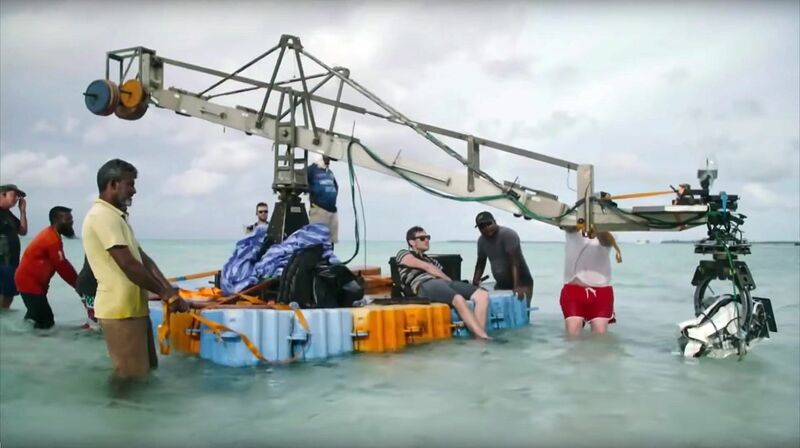 In one scene that takes place in a control room high above the surface of Scarif, the beach planet, we shot on a stage, and rather than light a bluescreen outside the set, we simply put white outside and bounced very bright light in, so the light became the background. 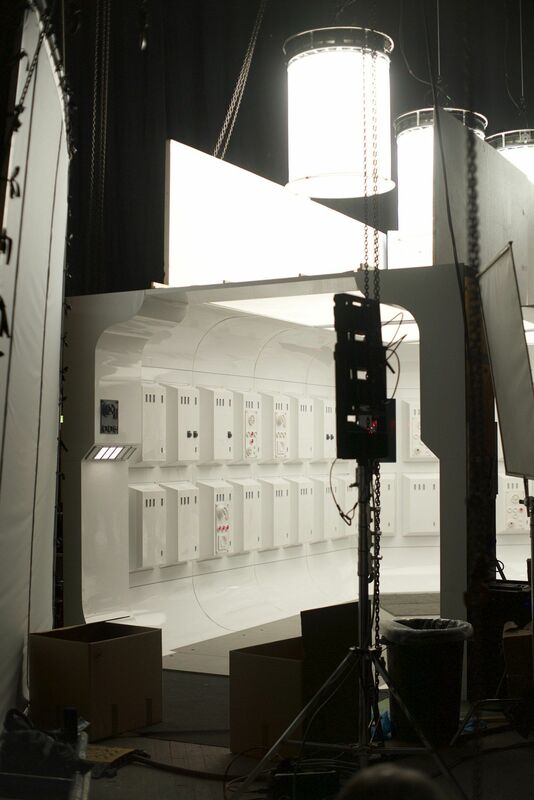 BB: On the second day of my set visit, I saw the giant walls of LED panels used as background for the shots inside the U-wing ship that was on a gimbal. 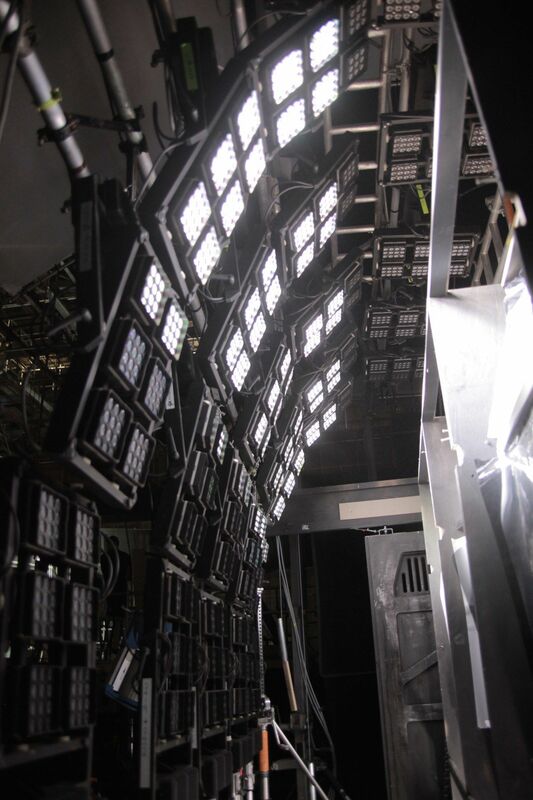 BB: Can you recall a particularly challenging lighting setup? Fraser: We recreated the Tanteve all-white set that appears in A New Hope, so the lighting had to be identical forty years later, but with different camera and different lighting. But it’s funny… the thing I feared photographing the most was Darth Vader’s shiny black helmet, because it reflects everything! So we did a series of tests over several weeks with my gaffer Perry Evans to make it look as natural as possible. We ended up with full silks about 10 feet above his head, far away from the source. And we oriented the seams in such a way as to get a kind of ‘mohawk,’ with a dark area separating two streaked-out white patches. BB: There’s a range of camera motion in Rogue One, including handheld, Technocrane and dolly moves. Fraser: Gareth is a very good handheld operator, and that really worked, for example, for the intimate stuff inside the U-wing. But we also discussed our enjoyment of well-orchestrated dolly shots. 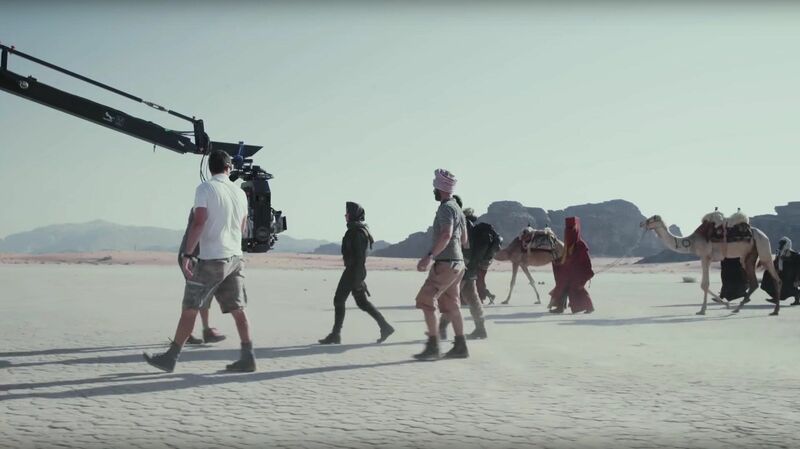 With a bit of planning, foresight and time you can do a really well-connected dolly shot that goes from one story to another. We feel that a dolly does that much better than a Technocrane. With a dolly, you can have a first, second and third position with clearly defined stops and speeds; like you might go at a medium speed between 1 and 2 then stop at 2 for 10 seconds and then between 2 and 3 do a gentle push-in, at 1/10th of the speed of the first move, and then do a very fast tracking shot between 3 and 4. Don’t get me wrong: a Technocrane is an incredibly handy and useful tool on set. The problem is that when the camera sits around on the Technocrane, you tend to use it all day, rather than pulling the camera off, laying some dance floor and starting again with a dolly. 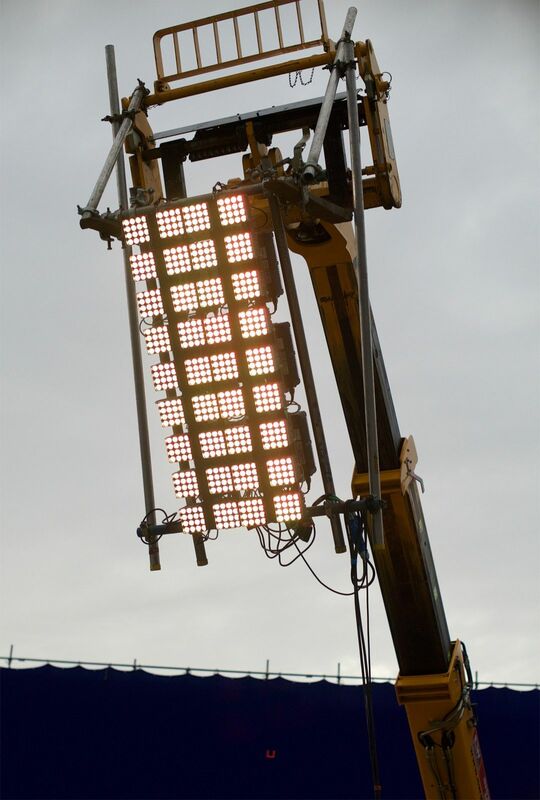 The Technocrane doesn’t do starts and stops very well, so you often find that the camera keeps moving through a scene. And it doesn’t quite feel have the feel of a grounded heavy camera. This is just my opinion and I’m happy to discuss this with anyone over a beer! BB: What’s it been like working with director Gareth Edwards? Fraser: Gareth is an incredibly strong, visceral storyteller. He does the classic thing of painting a picture that evokes a thousand words. Fraser: Gareth loves improvisation, and the LED system worked out very well for that, because I could stand outside a 360-degree set with my desktop operator and change levels and coloring on the fly. I could easily change the color of a wall mid-take or on the second take. In a way coloring and lighting on the fly is like working in four dimensions at once. In fact, the first take with Gareth is often a shooting rehearsal, and there’s nothing like a shooting rehearsal to get everybody’s blood pumping! Everybody steps up and performs. The first take keeps me on my toes. If, for whatever reason, I don’t know exactly how an area of the set is going to look, after the first take suddenly I know, because I’ve committed to it. BB: You were a pioneer with two technologies on Rogue One. You were the first to use an Alexa 65 with Ultra Panavision 70 lenses, and the first to use all LEDs on a major studio movie. Was that scary? Fraser: I had a mixture of fear and excitement, and it was only possible because of the support from Gareth Edwards, the supportive people at Lucasfilm and my amazing crew, and gutsy, progressive suppliers. We’d never done it before, but we said, ‘If there’s a problem, we’ll work out how to solve it.’ And we did. It wasn’t all plain sailing technically, but we got through it. I love making movies that challenge me and push the medium. And Rogue One certainly did that. Unit photography by Jonathan Olley, Giles Keyte and John Wilson. Photos and frame grabs courtesy of Lucasfilm Ltd.